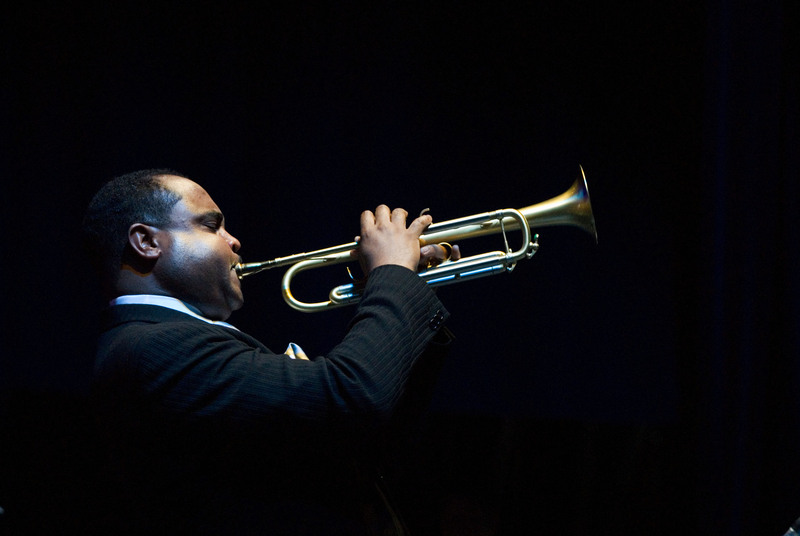 Trumpet ace Terell Stafford is one of the more recent members of the line of accomplished Jazz musicians emanating from Philadelphia. By his own admission he didn’t start to take Jazz seriously until 1981, but a Bachelor of Science degree in Music Education from the University of Maryland in 1988 and a Master of Music degree in classical trumpet from Rutgers University have endowed him with an enviable fluency and roundness of tone. A chance musical encounter led him to join HORIZON, Bobby Watson’s notable hard-bop quintet, in 1990. The ensuing five years with HORIZON added a practical reality to Stafford’s academic grounding, taking him on regular European tours that included the Montreux Jazz Festival (1992) and the North Sea Jazz Festival (1994). With Watson’s group Terell has played New York’s Blue Note and Sweet Basil, appeared at Carnegie Hall and the Jazz Times Convention. Since the mid-1990’s Terell has been performing as an integral part of various jazz groups led by such stellar performers as Cedar Walton, Sadao Watanabe, the Clayton Brothers, Herbie Mann, Kenny Barron, Matt Wilson and many New York based big bands including Jon Faddis’ Carnegie Hall Jazz Band, Wynton Marsalis’ Lincoln Center Jazz Orchestra, the Mingus Big Band and the Village Vanguard Jazz Orchestra. Stafford has appeared on television (Tonight Show with Jay Leno, You Bet Your Life with Bill Cosby); the soundtrack for the feature film, A Bronx Tale, and on NPR’s Jazz at the Kennedy Center, where he performed as featured guest artist with the Billy Taylor Trio. In 1997/1998 Terell toured Europe with the CARNEGIE HALL JAZZ BAND and the GEORGE GRUNZ ORCHESTRA as well as appearing on festivals in Spain, the Estoril Jazz Festival in Portugal and the Wigan and Candid Jazz Festivals in England. 1998 was a particularly busy year for Terell with engagements at the Jazz Standard and Sweet Basil Clubs in New York City. In the fall of 1998, Terell toured Europe again, fronting his regular band, featuring Victor Lewis on drums. He also joined THE TRUMPET SUMMIT BAND, sharing the stage with such luminaries as Clark Terry, Benny Bailey, Jon Faddis, Roy Hargrove, Nicholas Payton and, in August 1999, Wynton Marsalis. In July 1999 Terell toured Europe again with the JAM SESSION package, a contemporary version of the classic Norman Granz’s Jazz At The Philharmonic concerts. The band was featured in most of the major European Festivals, such as North Sea, Umbria, Vienne, Vitoria, Molde, Stockholm, Antibes, etc. With Randy Brecker, Lew Soloff and Jon Faddis, Terell was also part of the massive European tour of THE TRUMPET SUMMIT BAND in July of 2000, doing a tribute to Louis Armstrong. Terell has recorded 3 times with HORIZON, also with Stephen Scott, Lafayette Harris and with his friend and musical sibling saxophonist Tim Warfield, whom he invited on the rite-of-passage album for Candid, Time to Let Go. This was his first album as leader, marking the moment he felt appropriate to strike out on his own. Here Stafford’s vigorous attack, liquid delivery and keen melodic sense are balanced by a poise and patience normally found in the playing of trumpet elder statesmen. His second album, Centripetal force, also on Candid, included two HORIZON alumni, Stephen Scott and drummer Victor Lewis, plus Warfield and talented guitarist Russell Malone. His next recording, Fields of Gold, on the Nagel-Heyer label, featured a superb blend of classic and contemporary material. His first CD for the MaxJazz label, New Beginnings, was released in 2003. Between 2006 and 2007 Stafford played an integral part on several albums including Diana Krall’s Grammy nominated From this Moment On (2006) for which Stafford joined with the Hamilton-Clayton Jazz Orchestra. In celebration of Jimmy Heath’s 80th birthday, Stafford recorded with the Jimmy Heath Big Band for the album Turn Up the Heath (2006). As a member of drummer Alvin Queen’s band, Stafford is heard on the album I Ain’t Lookin’ at You (2006). A regular member of drummer Matt Wilson’s group “Arts and Crafts,” Stafford is featured on the album Scenic Route (2007). His most recent CD, Taking Chances, was published by MaxJazz in 2007. In addition to his work as a performer, Terell maintains a high profile in Jazz education. He is currently full-time Professor of Music and Director of Jazz Studies at Temple University in Philadelphia, and is a clinician for the prestigious Vail Foundation in Colorado and Jazz at Lincoln Center’s Essentially Ellington Program. He has also served as a member of the faculty for the Juilliard Institute for Jazz Studies in New York. Terell Stafford has been hailed as “one of the great players of our time, a fabulous trumpet player” by piano legend McCoy Tyner.